Gourmandizing television personality Hidehiko Ishizuka has a famously large appetite. Apparently, the portly comedian also has a taste for Japanese sake. On a clear February afternoon in the sake-producing region of Fushimi, just south of Kyoto, a camera crew forms a tight circle around Ishizuka as he samples a glass of sake in the tasting room of Matsumoto Shuzo, a historical brewery and designated heritage site. “This sake is dangerously good,” he murmurs appreciatively. After a few more sips, he declares his signature catchphrase, “maiu” (a play on the Japanese word umai, meaning “delicious”). The footage will be used in an upcoming episode of “Ishi-chan no Sake Tabi” (Hidehiko Ishizuka’s Sake Journey), a new original series from Amazon Prime Video, a subscription video-on-demand service from Amazon Japan. The weekly program, which began streaming on Feb. 3, follows Ishizuka and sake expert Masanori Takahashi as they visit 20 sake makers across the country, sampling regional delicacies along the way. Each show focuses on a single producer and takes an in-depth look at different approaches to sake making. The concept, Takahashi says, is to showcase the next generation of brewers, who are reviving lost styles and creating distinctive brews that resonate with today’s drinkers. “Five years ago, young Japanese were turning away from sake, but young brewers are working hard to bring sake back to young people,” he observes. At Matsumoto Shuzo, Takahashi and Ishizuka talk with Hidehiko Matsumoto, the brewery’s 35-year-old toji (master brewer). Matsumoto offers his guests two kinds of sake that demonstrate the brewery’s philosophy of preserving tradition while continuing to innovate: Hinodezakari Honjozo, a ricey brew that Matsumoto recommends serving warm; and Shuhari Sawaya Matsumoto Junmai Daigingo, a bright and fruity variety with juicy acidity and a touch of fizziness. “Ishi-chan no Sake Tabi” also incorporates bits of local history and food culture. Before arriving in Fushimi, the crew stops at Kyoto’s Matsuo Taisha, the ancient Shinto shrine where the god of sake brewing is believed to reside. After the tasting at Matsumoto Shuzo, Ishizuka and Takahashi head back to Kyoto for a meal at Michelin-starred Sojiki Nakahigashi, where chef Hisao Nakahigashi prepares modern kaiseki (multicourse Japanese haute cuisine) with ingredients foraged from the mountains north of Kyoto. Each course is served with a different brew from Matsumoto’s Shuhari Sawaya line-up, and Ishizuka comments on the pairings while hamming it up with the chef. According to Prime member comments on Amazon Japan’s website, viewer response has been highly positive. The program is in Japanese. 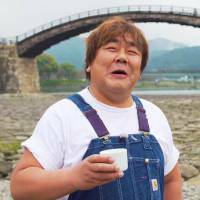 Part of the show’s appeal is Ishizuka’s genuine enthusiasm for sake, and the fact that he actually imbibes on camera — something the comedian’s fans never get to see on regular television. Although he clearly enjoys the eating and drinking, he notes that his favorite part of making the series is getting to know the brewers and understanding the production process: “There’s so much effort and thought that goes into the sake. If you know the story behind the brew, the taste is different,” he says.